The well known Karoo author and photographer couple, Chris Marais and Julienne du Toit, launched their latest book on the Karoo last night at the Ron Belling Art Gallery in Port Elizabeth. Chris and Julienne did a slideshow and spoke about their travels and the people and animals that they encountered in the Great Karoo. The book, aptly called Karoo Keepsakes II, is a continuation of their initial book Karoo Keepsakes. It contains stories of Karoo people and, as usual, spectacular photographs of the Karoo. The two books are ideal travel guides for any person who plans to visit the Karoo. The book can be ordered directly from their website www.karoospace.co.za or bought at Fogarty’s Bookshop in Walmer Park, Port Elizabeth. 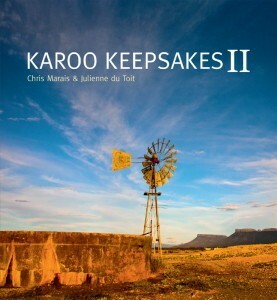 Well done Chris and Julienne - we look forward to Karoo Keepsakes III !! !